Vismaya Water Theme Park is located in Parassinikadavu in Kannur district. 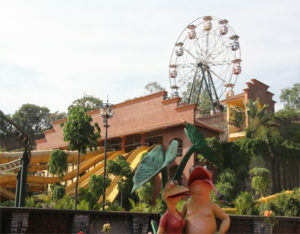 This theme park is established and managed by Malabar Pleasures Pvt. Ltd. The facilities provided here are prayer hall, restaurants, conference hall, shops, dormitory etc. Some of the attractive rides offered here include Virtual waterfall, Laser show, Aqua trail, Wave pool, Electric swing, Sky train, Giant wheel, Tornado, Twister etc. With a group of 10 students, a staff member can enter free of cost.